034Motorsport is pleased to introduce the P34 Performance Air Intake System for 8V/8S Audi A3/S3/TT/TTS & MkVII Volkswagen Golf/GTI/R! 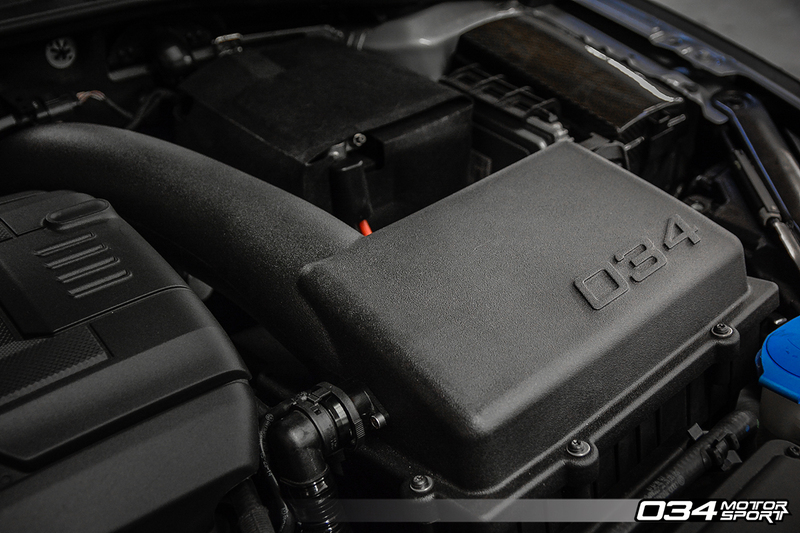 034Motorsport’s engineers invested significant effort in developing a comprehensive performance intake solution for Audi/Volkswagen EA888 1.8T/2.0T Gen 3 engines, which provides noticeable gains in horsepower and torque over the factory airbox. Throughout the development process, multiple designs were modeled, prototyped, and tested, to ensure that the P34 Air Intake System delivers measurable performance benefits and excellent fitment. 034Motorsport engineers started by identifying the shortcomings of the factory intake system to determine which components restricted airflow to the turbocharger inlet. While the factory lower airbox and fresh air duct to the core support were more than sufficient for increased power levels, the factory air filter, upper airbox, and turbo inlet tube were deemed too restrictive, even with the factory turbocharger. 034Motorsport's mechanical engineers scanned the factory engine bay and modeled a one-piece unit to replace the factory intake tube and upper airbox. By eliminating the multiple couplers, transitions, and jagged features in the factory upper airbox and intake tube, 034Motorsport's engineering team was able to drastically reduce turbulence in the intake tract, and virtually eliminate pressure drop in the intake system before the turbo inlet. Multiple iterations were prototyped in plastic using 034Motorsport's in-house FDM 3D printer and thoroughly tested. Ultimately, the best-performing design was a fully-enclosed unit featuring a large-diameter one-piece intake tube with smooth transitions all the way back to the factory turbo inlet. To ensure that the P34 Air Intake System draws in cool, dense air, 034Motorsport engineers opted for an enclosed design to prevent hot air from the engine bay entering the intake tract. By bolting to the factory lower airbox, this approach allows the enclosed high-flow panel filter to breathe fresh, cold air from the factory inlet duct before the radiator. 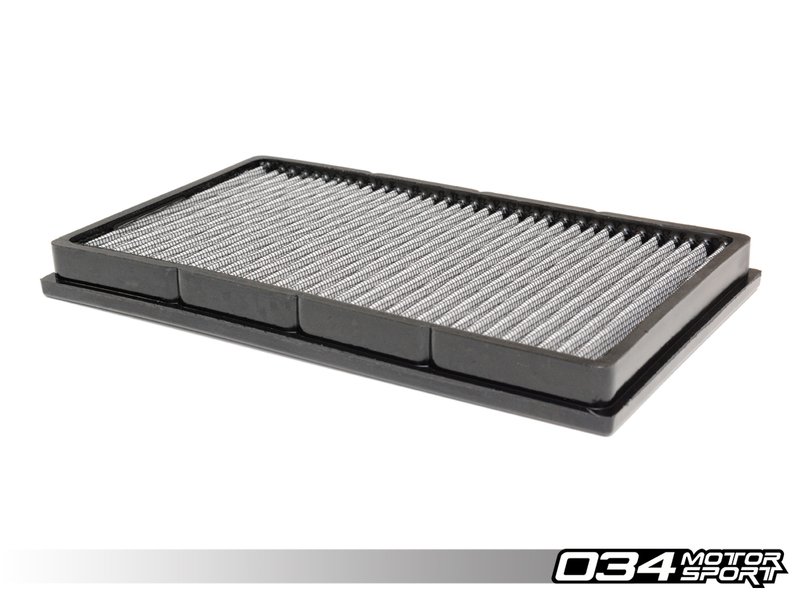 The 034Motorsport P34 Air Intake System houses a high-flow panel filter with double-layer pleated cotton filtration medium. This air filter design offers increased flow and excellent filtration. 034Motorsport carefully selected the textured finish of the intake tube and upper airbox heat shield to complement the factory plastic trim and engine covers. The 034Motorsport MQB Audi/Volkswagen 1.8T/2.0T Cold Air Intake System was designed to fit like a factory part, and mates directly to the turbo inlet pipe and factory lower airbox to provide an OEM+ look. 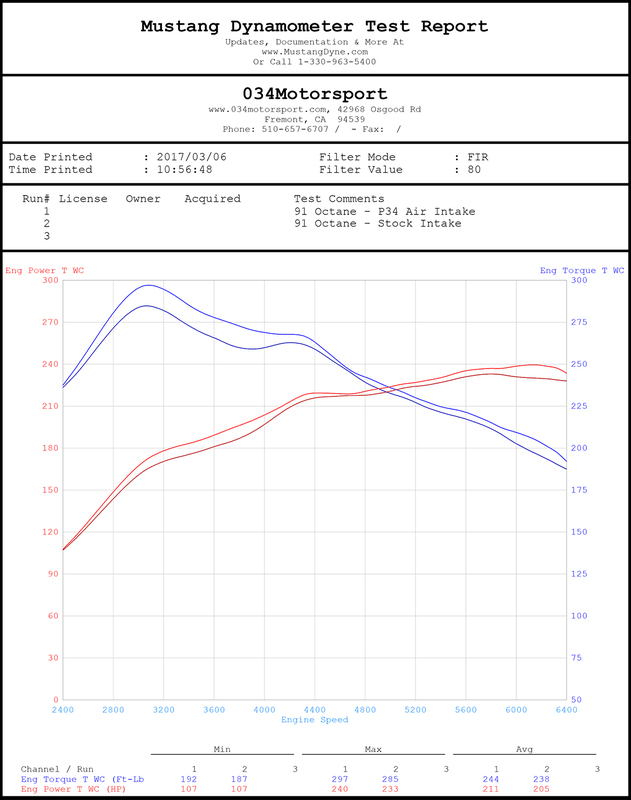 034Motorsport's engineering and development efforts were validated using our Mustang AWD Dynamometer to ensure that the P34 Cold Air Intake System provided substantial, repeatable increases in horsepower and torque. Please Note: This comprehensive air intake system is designed to install on vehicles with or without factory secondary air injection (SAI) systems. No additional parts are needed! Please Note: Not for use on emissions-controlled vehicles in California.